Pixar has gotten a lot of flak over the last few years for their increased focus on sequelizing their most popular – and *cough* profitable – brands. And yet, with the huge, bold exception of 2011’s running-on-empty Cars 2, the rest have outdone or, at the very least, honored their delightful predecessors. Both Toy Story follow-ups were widely celebrated and embraced by fans, while the underrated Monsters University prequel brought enjoyable new energy, personalities and off-beat humor to the world created by Monsters, Inc.
Finding Dory, the dubious-on-paper extension of 2003’s Finding Nemo, once again proves the studio knows how to milk a property with creative zest, soulfulness and smarts, if a little less richly so than in the past. Returning writer-director Andrew Stanton (who also masterminded Wall-E) knows how to tell an involving tale and deliver the required emotional wallop, and here he ups the ante in terms of ambitious action set-piece staging. And although it’s pretty unlikely many will place this entry above its now classic Best Animated Feature Oscar-winning forebear, it does earn its place next to it on the shelf. On a visual level, the film is arresting to behold. 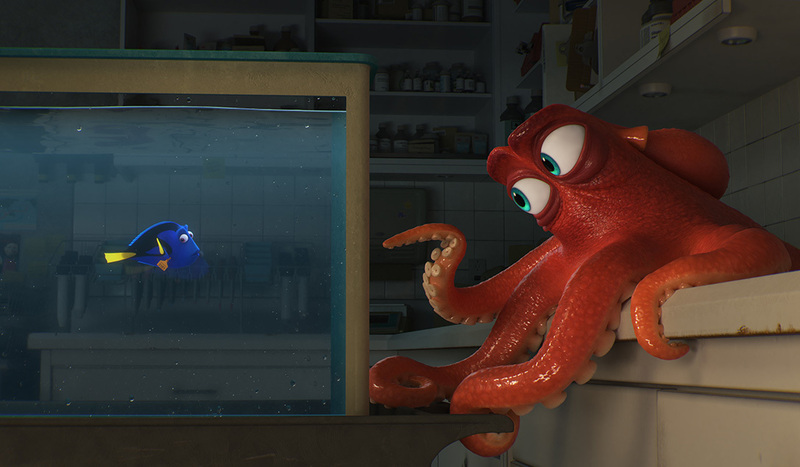 Vibrant and practically exploding with bright, striking colors Finding Dory captures the same sense of relaxing, tranquil beauty that comes from witnessing the most awe-inspiring of underwater sights. This movie is meant to be seen on the big screen, and it’s also the rare 3D experience that won’t leave you feeling ripped off when you’re tossing your plastic glasses into the recycle bin after the show. There’s an immersive quality to the animation Pixar’s team of artist wizards have accomplished that not only irresistibly draws you into the wondrous setting, but also helps keep your attention rapt during some of the more busy and ultra-cartoony later happenings. 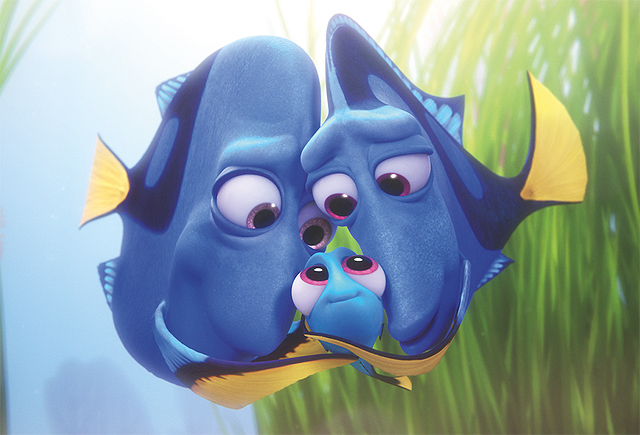 Tugging at the heartstrings right from the get-go, the picture opens with an effective and adorable childhood flashback wherein the short term-memory challenged blue tang (Ellen DeGeneres as adult Dory, Sloane Murray as infant) is separated from her loving parents (Eugene Levy and Diane Keaton) after wandering off on her own. Unable to remember how to get home she embarks on a scattered and lengthy expedition, forced to depend on the kindness of strangers, all the while travelling farther and farther from her destination. This sad, fruitless journey ultimately draws her to the panicked Marlin (Albert Brooks), as he searches for his lost son. Cut to one year later. 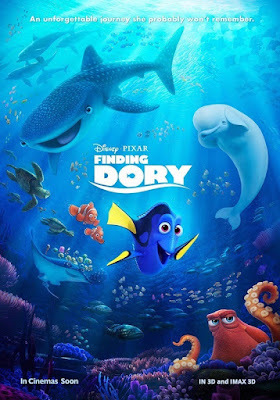 Living happily with Marlin and Nemo (Hayden Rolence, replacing Alexander Gould), the plucky and carefree Dory experiences a sudden revelation about the location of her lost parents following a clumsy stingray accident. Dragging her two reluctant pals with her, she ventures to the California-based Marine Life Institute (which has a prominent celebrity spokeswoman! ), where injured and sick fish are rehabilitated for release back into the ocean. There she finds an invaluable ally in surly seven-armed octopus “septopus,” Hank (Ed O’Neill, perfectly world-weary), who agrees to help in exchange for assistance in attaining a transfer to permanent aquarium captivity. As the two clownfish attempt to save Dory from herself, she and Hank embark on a chaotic and dangerous odyssey through the park in order to complete her lifelong quest. Intentionally mirroring their protagonist's brief attention span, Stanton and his co-writers have structured their film with an emphasis on sporadic incident over smooth narrative flow. 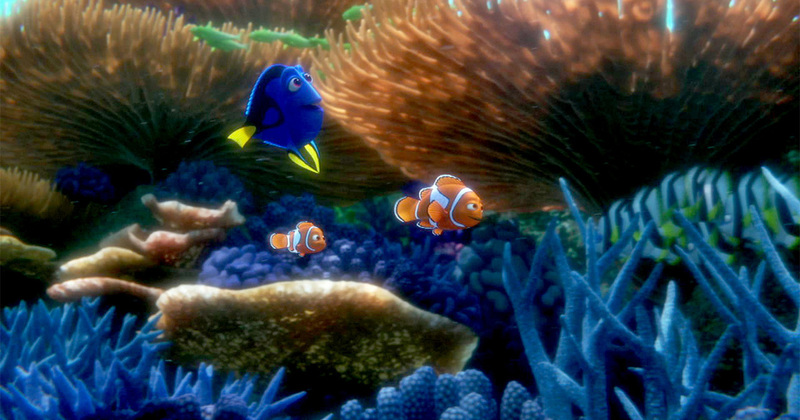 This approach unquestionably allows for a wider variety of mini-adventures, as both Dory/Hank and Marlin/Nemo head off in different directions, with an abundance of fertile possibilities for comedy and go-for-broke imagination. In addition to Hank’s endless hilarious camouflage demonstrations, there’s also plenty of time for memorable encounters with new series additions such as short-sighted whale shark Destiny (Kaitlin Olson), a pair of hooligan sea lions (reunited The Wire co-stars Idris Elba and Dominic West) and a particularly dim loon named Becky. Also extraordinary is a visit to a fish petting pool that manages to be simultaneously nightmarish and totally side-splitting. However, Finding Dory’s emphasis on lightning-paced episodic escapades also makes the film feel a bit hurried. 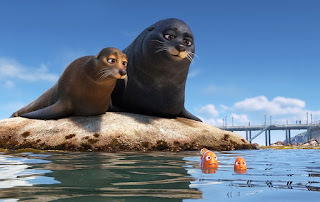 Kids will undoubtedly get a rush from its madcap drive, but older viewers may yearn at times for the comparatively more restrained storytelling techniques of superior Pixar efforts such as Up, The Incredibles or Ratatouille. Especially once the genuinely moving tear-jerking developments arrive and it feels like the movie’s nervous about allowing much breathing room for fear of losing momentum. Because it’s hard, as an adult, to not desire more occasional pauses to appreciate and consider the picture’s compelling and powerful central theme; highlighting the countless challenges placed on those living with special needs. 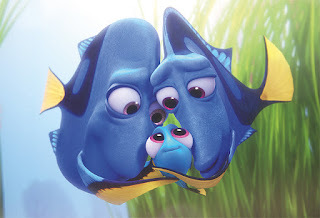 The best section of the film – which belongs in the pantheon of all-time great Pixar achievements – is an extended first-person sequence where a distressed Dory finds herself alone, confused and helpless, and must rely on her own unique coping strategies to talk herself through the situation. It’s scenes like this, as well as the poignant time spent with our heroine and her parents, that reminds us just how magical, essential and matchless the studio can be when they’re firing on all cylinders. And, frankly, Pixar’s most fearsome competitor at this point – outside of the extremely odd Disney or Dreamworks miracle like Zootopia or How to Train Your Dragon - is themselves. Having created a procession of modern masterpieces they’ve set a bar that’s just not possible to clear every time out. So although Finding Dory only belongs somewhere in the middle of their priceless catalogue, it’s still a sweet, fun and engaging spectacle that enthusiastically swims along in very, very good company.